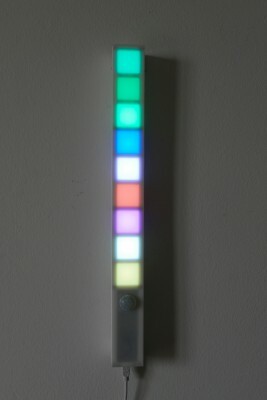 “WeMakeColors” is a network of artworks made of matching devices that dynamically generate random colors based on the physical presence near each device. All copies of the artwork broadcast to each other the new colors in real time scrolling like in a social network timeline: new colors enter from the top and old ones exit from the bottom. The artworks create an interaction between persons in different places, which cannot be fully decided by the users and, therefore, is unintentional. The fact that you cannot just go there and have the color scroll to your want makes it passive interactive. In this minimal social network the belonging to the community and the communication process are primary, not the individuality, which fades into them. Our today’s fascination for virtual communities determines a change in individuality, which achieves its ontological value through communication. It is an I-many, I-world bond, it does not matter who, what matters it is the relationship. The other actual area of reflection this work addresses is that today’s boundaries of privacy have expanded until becoming barely controllable by individuals and the possibility of remaining anonymous, while belonging to a community, stimulates the thought on the sense of this loss of privacy, but also on the desire to protect it. The use of open source software increases the transparency of what you communicate, allowing the permanence of privacy areas made consciously anonymous. This is the moment of the Internet of Things and in the near future the number of objects connected to the Internet will rise and will transmit a lot of information about you and your habits without you being fully conscious of it. For instance, if your television uses a specific amount of energy, through this simple information it would be possible for companies to detect which programs you are watching.Being conscious is the key for sharing, belonging, but at the same time for protecting our own individualities. This entry was posted in Light, Works. Bookmark the permalink.